Fort Monroe Virginia Mini Session Special! Stories of Joy Photography turns ONE years old today! It has been an amazing year, and I plan to blog separately about my wonderful clients and sessions. But today, I get to announce a Fort Monroe Special for NEXT WEEK! I met Jeni, The Village Midwife, a little over two years ago when awaiting for my niece's birth. I was immediately impressed with Jeni's professionalism, knowledge, experience and warmth. My sister was planning on a home birth, and I knew she was in good hands. Even since then I have wanted to collaborate with The Village Midwife somehow, and this coming week we get to finally join forces! Anyone is welcome to join us at Fort Monroe Virginia, for mini sessions. Families, children, seniors, expectant mamas, pets, or come for a professional head shot or updated Facebook photos! Sign a model release for The Village Midwife and Stories of Joy to use your images for our online presence to receive $25 discount! The 15 Minute Mini Session is perfect when you are ready to step in front of the camera and get your pictures taken and done. See what I can do in 10 minutes here. With The Village Midwife discount your session is only $75. If you know you or your kids or your husband or pets need a little more time than that, then the 30 Minute Session is for you. We can document a short activity (some ideas in image), or do traditional posing. The Village Midwife pricing for this session is $130. The One Hour Session is most fun. We get to do an activity AND get traditional poses done as well. 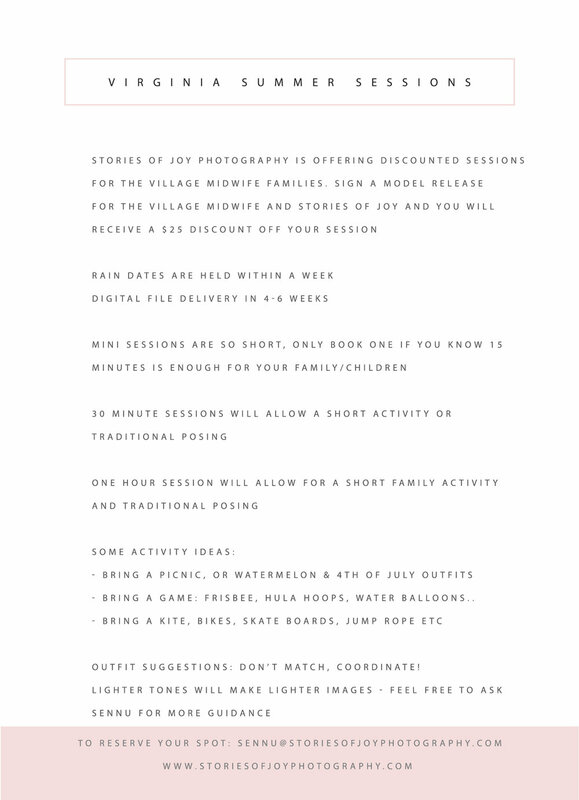 If you have a larger family, or want to bring grandparents along, this session is the right one for you. Discounted Village Midwife price is $170. I will be in Virginia for two weeks, and if you're interested in an in-home session, a Day in the Life Session, birth photos, newborn photos or Fresh 48, contact me for discounted Virginia pricing. When booking, don't forget to mention The Village Midwife to receive your discount! If you have any questions, don't hesitate to contact me. 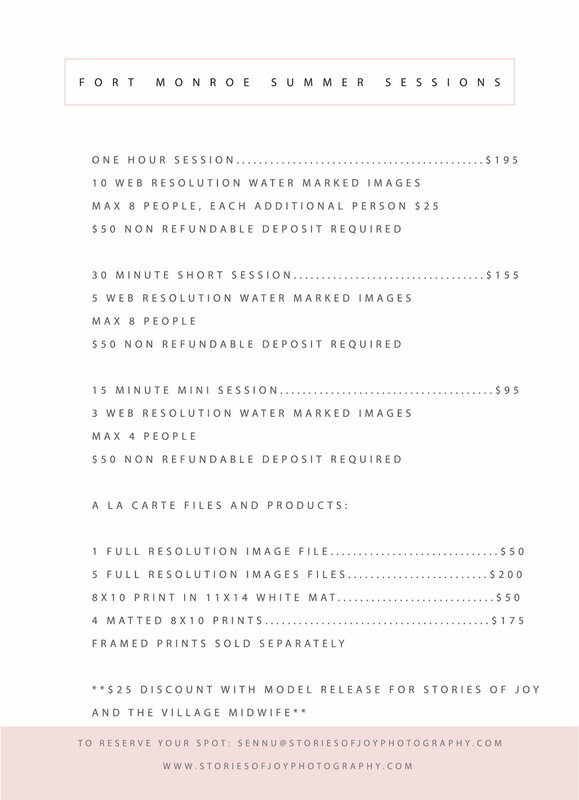 A non-refundable $50 deposit toward your session is required to book your session, the rest is due at session day. The time slots are in 15 minute increments. You would pick two for 30 minutes, or four for a One Hour Session. Contact me to reserve your spot, and see you SOON!